In recent times we can see a great surge in the development and release of custom ROMs. With the release of Android 8.0 Oreo making way for the developers to bring out the customized version of Android ‘O’ for every other device that is not currently getting official OS upgrade. In our previous posts we mentioned about newer Custom builds are making round every day mostly from the mid-rangers to the flagships. What’s most noteworthy is the efficiency and accurateness of these custom ROMs. Although being fresh builds tends to showcase some bugs, most of the features work just as it would on the official build seeded by Google. Following the path of the AOSP based ROM Port, the developers have rolled out the Android 8.0 Oreo for Asus Zenfone 5 based on latest AOSP sources. This ROM is an Alpha build which means it aims towards getting the first-hand users’ review on the custom ROM for Asus Zenfone 5. It has a few features still under development and non-functional right now. But they might soon get working and an updated ROM will be released with those features working. Even the official build from Google has its share of inconsistencies and bugs. custom ROMs come really close in terms of workability and efficiency so we should count on the unofficial build. And all this awesome efficient development was carried out by developer tank0412. A big round of cheers and applause to his hard work. Since this ROM Android 8.0 Oreo for Asus Zenfone 5 is an unofficially built, your Asus device needs to be rooted and installed with TWRP recovery. Also, the bootloader of the device has to be unlocked. We have detailed below the installation process and also provided the download links for Android 8.0 Oreo ROM for Asus Zenfone 5. 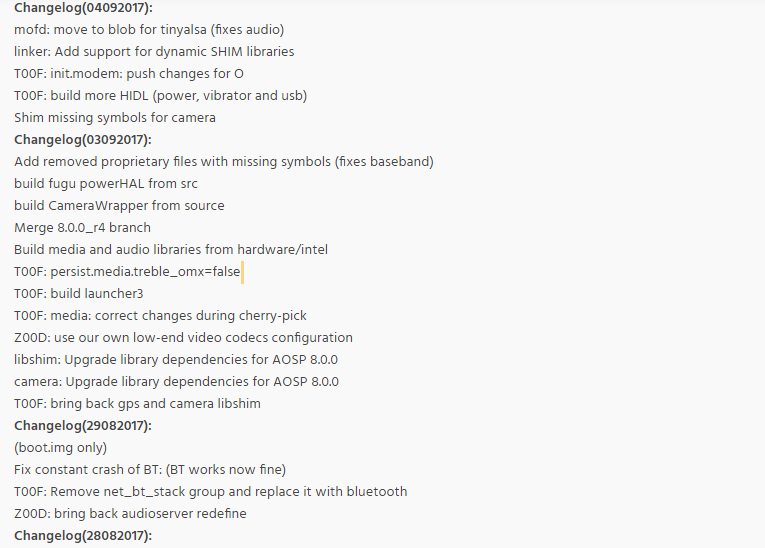 Here is the complete changelog by the developer right from the day of release of the Alpha build of the ROM. Here are the few features that work perfectly in this ROM build. It is the newest build of the ROM so these aforementioned features might not work as of now. But the developers will hopefully fix it soon and release an updated version. Here we are providing the direct link to download the Android 8.0 Oreo custom ROM build for Asus Zenfone 5. Now, let’s move to the installation process of the ROM in Asus Zenfone 5. But before that, here are a few points/guidelines we are laying down which You should heed carefully before moving on with the OS upgrading. Root Your device and install the latest TWRP recovery. Take a full backup of Your device data in case data gets removed/corrupted. Fully Charge Your device to avoid any interruption during installing the update. Know that by the rooting warranty of Your device will remove permanently. AndroidSage will not be responsible if any damage occurs to Your device. Step-1 Download the custom ROM and GApps from the above download section. Step-2 Transfer the downloaded files from PC to Your device. Step-3 After that install the latest TWRP on your device. Step-5 Now, perform a full wipe that includes wiping out Cache, Dalvik cache, and system data. 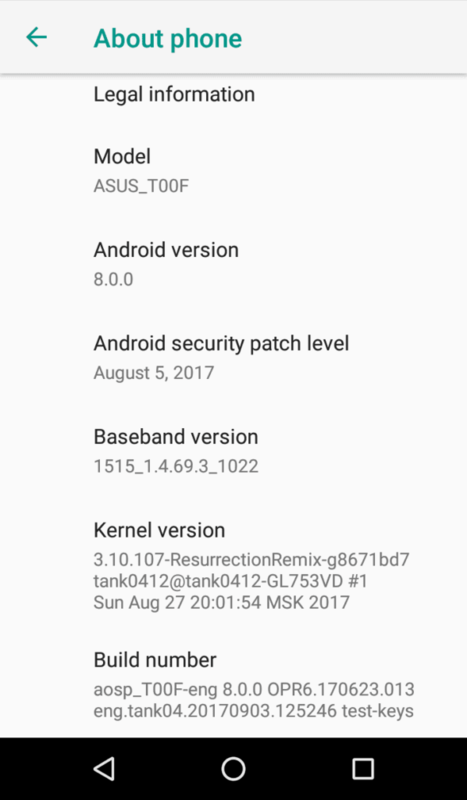 Step-6 Then flash the Android 8.0 Oreo custom ROM for Asus Zenfone 5. Step-7 Now, finally flash the GApps and reboot to the system. Well, You have finally installed Android Oreo 8.0 for Asus Zenfone 5. Enjoy the Alpha build of the custom Android 8.0 Oreo on Your Asus device. And do connect with us for getting the latest updates on Android 8.0 Oreo.